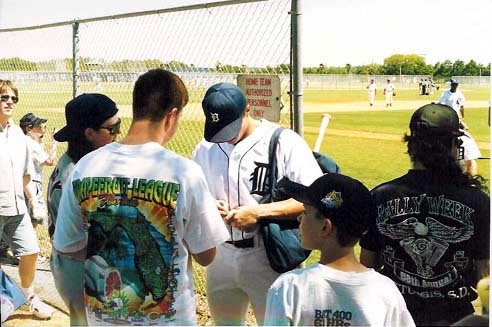 Tigertown, aka Joker Marchant Stadium, has played host to the Tigers since 1966, and the Tigers have played in the same city, Lakeland, since 1934, an MLB record. Perhaps the age of the stadium, or the tenure of its fan base, is what makes Tigertown such a special place. This is an old stadium, but do to numerous renovations, it is still one of the best fields in Florida. Judging from the huge banners featuring former Tiger greats, and the stadium's location on "Al Kaline Drive," there is a definite sense of Tiger pride here. This truly is a first class facility with first class fans. Good seats are not too difficult to get, if you purchase early, and the fans are some of the best in the state. This place has the best concessions in the Grapefruit League- be sure to eat at the grill. Tigertown is an elaborate complex containing batting cages, practice fields, and a recreation building. 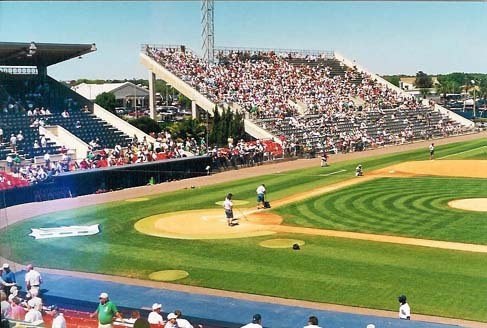 Tigertown's capacity is 7,100 making it one of the smaller stadiums in Florida and a very cozy place to see a ballgame. It's really quite difficult to explain what makes this stadium so special- perhaps its the ambiance, perhaps its the fact that the Tigers are so bad, yet the fans keep coming to the games. Whatever it is, Tigertown is an amazing place, and definitely my very favorite place to see a game. Joker Marchant Stadium is the best place to see a spring training game, out of both of the two leagues. It is a must for anyone on a spring training trip. At every gate of the stadium are giant banners like this depicting Tiger greats. This continues the strong sense of Tiger pride inherent at the park. And, speaking of Tiger greats, the legendary Al Kaline has been known to drop by from time to time as a coach. Like other stadiums, if you go to the practice fields to get autographs, you will not find the giant crowds you often encounter within the stadium. A very cozy park, although the giant bleachers seem to take away from that a bit. Still an absolutely gorgeous stadium with a very well kept field and a friendly staff. Autograph tip: Joker Marchant is one of the few places where it is almost always better not to hang around the dugout for autographs. There is a practice field behind right field which is a great place to look before the game for autographs. Also, before the game, hang around the parking lot on the third base side of the stadium to get players' autographs as they drive to work. After the game, starting around the sixth inning, go back to this area on the third base side and hang around the team bus as the players board.